Today, NASA remembers the sacrifice of the crews of Apollo 1 and space shuttles Columbia and Challenger. Mission Control Center in Houston and the crew aboard the International Space Station observed a moment of silence and Commander Scott Kelly sent down a few words memorializing the lost astronauts. The six residents aboard the space station kept up their pace with spacewalk preparations, Cygnus cargo transfers and advanced space science. The orbital laboratory also completed two of a series of reboosts on Wednesday ahead of a crew swap and a cargo delivery planned for March. Cosmonauts Yuri Malenchenko and Sergey Volkov checked out their Russian Orlan spacesuits and tools before next week’s spacewalk. 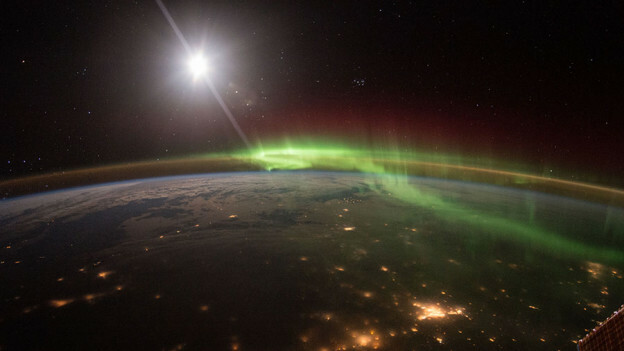 The duo will install hardware and science experiments on the station’s Russian segment. 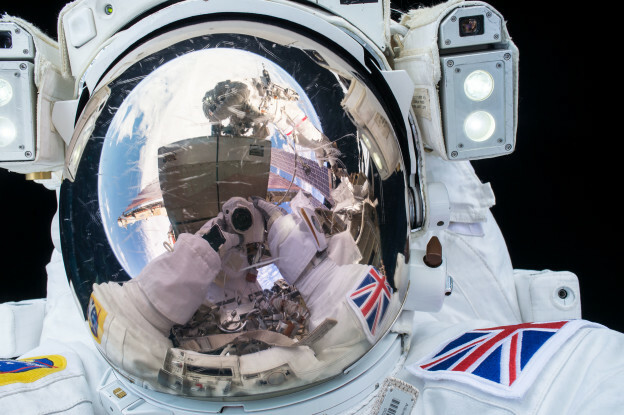 NASA TV will broadcast the spacewalk live beginning Wednesday at 7:30 a.m. EST. Astronauts Tim Kopra and Tim Peake worked throughout the day transferring cargo from the Orbital ATK Cygnus space freighter. The Cygnus is due to leave the station’s Unity module Feb. 19 and burn up over the Pacific Ocean the next day. The six Expedition 46 crew members today prepared for the deployment of a pair of nanosatellites, loaded trash in the Cygnus cargo craft and reviewed timelines and procedures for a Feb. 3 spacewalk. The International Space Station will also raise its orbit ahead of March’s crew swap and cargo delivery activities. Commander Scott Kelly and British astronaut Tim Peake were inside Japan’s Kibo laboratory loading a satellite carrier and its deployer mechanism in the lab module’s airlock. After the Japanese robotic arm extracts the deployer from the airlock the Aggiesat4 and BEVO-2 nanosatellites will be deployed on Friday. The student-built nanosatellites will help further develop and refine autonomous navigation, rendezvous and docking software and procedures. Peake then joined NASA astronaut Tim Kopra loading trash inside the Orbital ATK Cygnus supply ship. The private space freighter is due to leave the station Feb. 19 ending its stay at the Unity module. Next, Kopra moved on to a combustion experiment testing how well different samples resist burning in microgravity. Cosmonauts Yuri Malenchenko and Sergey Volkov are a week away from the second spacewalk of 2016. The veteran spacewalkers reviewed the timeline and procedures they will use to install hardware and science experiments outside the station’s Russian segment on Feb. 3 at 8:10 a.m. EST. The International Space Station will raise its orbit Wednesday afternoon before a pair of crews swap places and a cargo ship arrives in March. One-year crew members Scott Kelly of NASA and Mikhail Kornienko of Roscosmos are set to return home March 1 along with Russian cosmonaut Sergey Volkov. Then, Expedition 47 will begin and three new crew members will arrive March 19. New supplies are scheduled to be delivered to the crew March 31 aboard a Progress 63 cargo craft. The orbiting Expedition 46 crew was back at work Tuesday on a series of life science and physics experiments to benefit life on Earth and crews living in space. 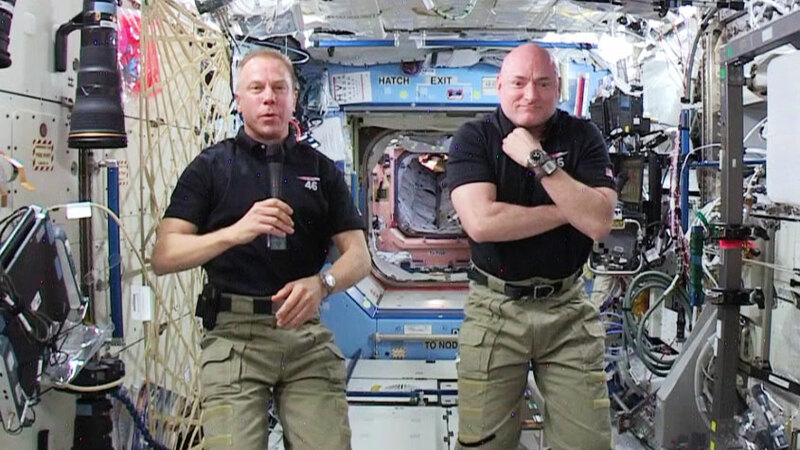 Commander Scott Kelly explored maximizing the effects of exercise in space while British astronaut Tim Peake studied how living in space affects using touch-based technologies, repairing sensitive equipment and a variety of other tasks. NASA astronaut Tim Kopra researched how materials burn in space. Two cosmonauts resized their Russian Orlan spacesuits today, checked them for leaks and set up hardware before next week’s maintenance spacewalk. Flight Engineers Sergey Volkov and Yuri Malenchenko will work outside Feb. 3 in their Orlan suits to install hardware and science experiments on the orbital lab’s Russian segment. 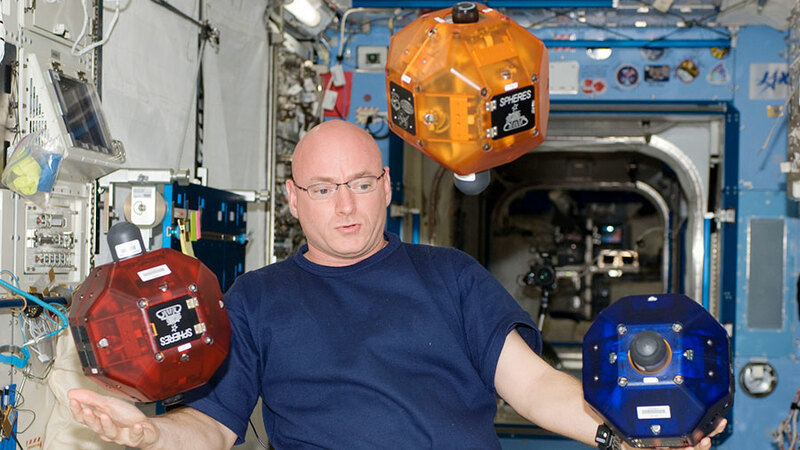 NASA astronaut Scott Kelly works with three SPHERES satellites in 2010 when he was a Flight Engineer for Expedition 25. The Expedition 46 crew brought out a pair of tiny satellites today so students can compete for the best algorithm in an ongoing competition. The crew also checked spacesuits, transferred cargo and worked on lab maintenance. One-Year Crew members Scott Kelly and Mikhail Kornienko set up a pair of bowling ball-sized satellites in Japan’s Kibo lab module for a student competition. Students compete to test their algorithms which operate the tiny satellites onboard the International Space Station for the SPHERES-Zero Robotics study. Veteran cosmonauts Sergey Volkov and Yuri Malenchenko checked their Russian Orlan spacesuits for leaks. The duo will exit the space station Feb. 3 for a five hour and 30 minute spacewalk to install hardware and science experiments on the orbital lab’s Russian segment. NASA TV will begin coverage at 7:30 a.m. EST with the spacewalk set to start 40 minutes later. NASA astronaut Tim Kopra worked on space plumbing during the morning before moving on to Cygnus cargo transfers. 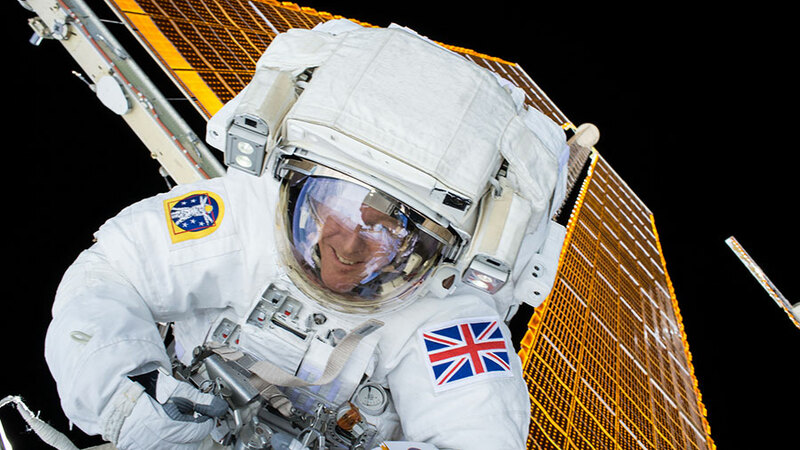 British astronaut Tim Peake worked on the Electrostatic Levitation Furnace, a device that will levitate, melt and solidify materials to study the thermophysical properties of different metals. 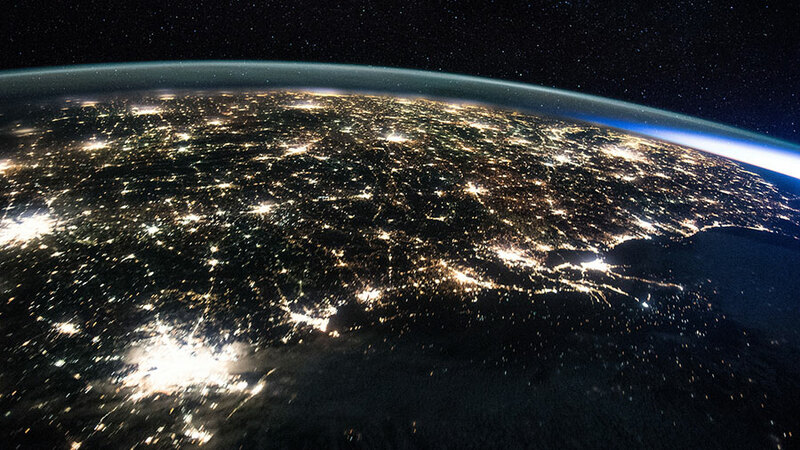 The night lights of Houston and the Gulf Coast are pictured from the International Space Station. The Expedition 46 crew of two U.S. astronauts, one British astronaut and three Russian cosmonauts practiced their emergency response skills today in conjunction with the Mission Control Centers in Houston and Moscow. The station residents also continued more human research to improve crew health while moving along with preparations for a Feb. 3 spacewalk. The crew members spent an hour today conducting an emergency drill to practice communication, familiarize themselves with safety gear and procedures and memorize evacuation routes. After the drill the crew called down to ground teams to review their actions and results. Meanwhile, international space science is ongoing as scientists and doctors explore the long term effects of living in space on a crew member’s body which could also benefit life on Earth. Commander Scott Kelly and Flight Engineers Tim Kopra and Tim Peake were conducting more eye checks for the Ocular Health vision study. Kelly also took a blood sample for stowage in a science freezer. Kopra and Peake were back at work exploring how an astronaut’s lungs adapt to microgravity for the Airway Monitoring experiment. Two cosmonauts, Sergey Volkov and Yuri Malenchenko, are getting tools ready for the next spacewalk scheduled at the beginning of February. The spacewalkers will work outside in space to install hardware and science experiments on Russian modules. 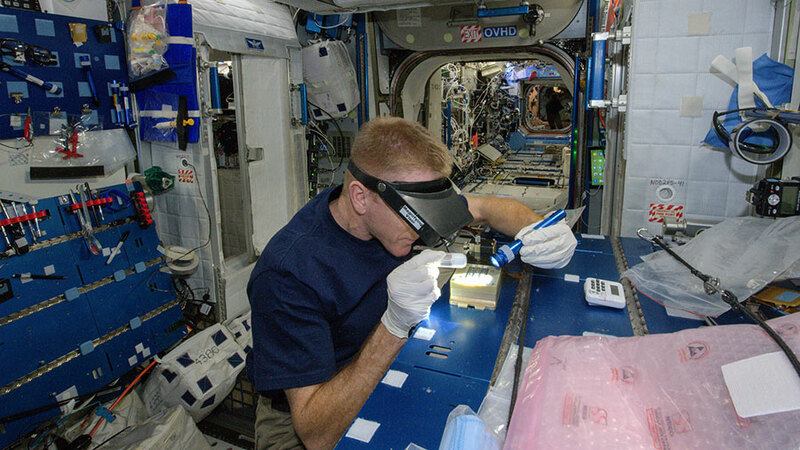 Astronaut Tim Peake uses a bar magnet to stir samples for a fluid physics experiment inside the Unity module. The six-member Expedition 46 crew participated in a range of long term space science Wednesday to benefit life on Earth and future astronauts. 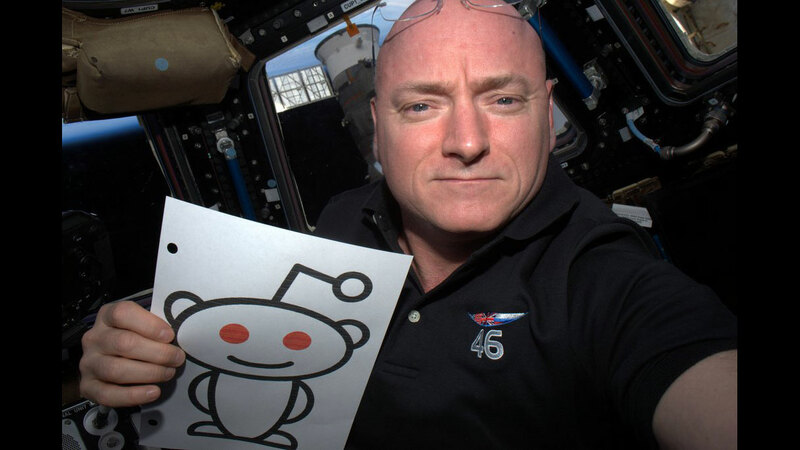 The crew is also gearing up for the second spacewalk of 2016 planned for early February. Astronauts Tim Kopra and Tim Peake participated in eye and blood pressure checks for the Ocular Health vision study. Kopra then scrubbed spacesuit cooling loops before reconfiguring their hardware. Peake set up gear for the Airway Monitoring experiment to determine how gravity and microgravity influence the lungs. 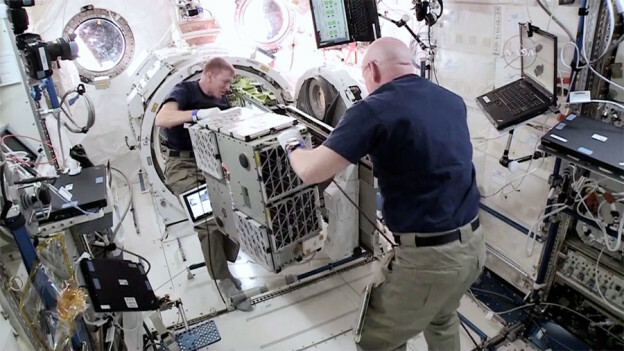 Commander Scott Kelly collected blood and urine samples and took ultrasound and blood pressure measurements for the Cardio Ox and Twins Study experiments. Cosmonauts Sergey Volkov and Yuri Malenchenko are getting ready for a Russian spacewalk planned for Feb. 3 that will be broadcast live on NASA TV. The duo prepared their Orlan spacesuits and the airlock inside the Pirs docking compartment. The spacewalkers will spend about five hours and 30 minutes installing hardware and science experiments on the Russian segment of the International Space Station.